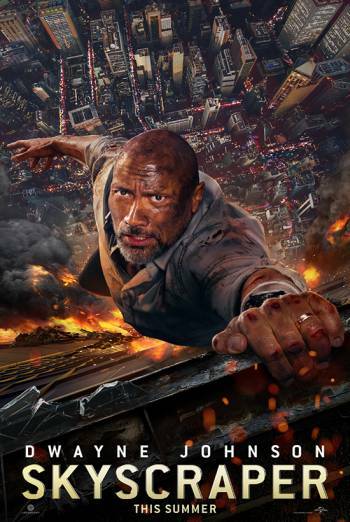 Synopsis: SKYSCRAPER is a US action drama in which a man risks everything to save his family. SKYSCRAPER is a US action drama in which a man risks everything to save his family. There are several scenes of moderate violence which include shoot-outs punches, kicks to heads and some use of bladed weapons. One scene shows a woman stabbing a man in his leg with a pair of scissors. Moderate threat includes a scene in which a man holds a boy as a human shield to protect himself from being shot. There are also scenes in which a family try to escape from a burning building. Injury detail includes a scene that shows a man with a cut and bloodied face in the aftermath of a bomb attack. In another scene, a man pulls a shard of metal out of his shoulder, with limited detail shown. There is infrequent use of strong language, as well as milder terms. There are several images that show a skyscraper on fire.